Location: East of Skara Brae, near the Hedge Maze. While visiting a neighbor in Skara Brae I came across Tiberius’ Book of Primary Virtues. After reading the book I became intrigued and I set out to find the Temple and learn more about him. To find The First Tiberian Temple of Virtue follow the road East of Skara Brae. 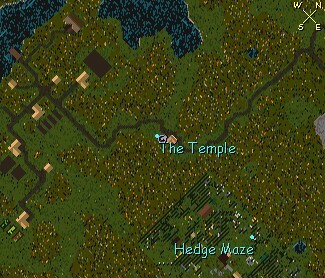 The Temple can be found just slightly off the road. Tiberius and Octavian are reclusive because a life of contemplation requires much meditation. However if you send them a letter you can arrange to receive teaching in the Tiberian Virtues and possibly be ordained as a knight if you can pass the ordeals. It should also be noted that Tiberius’ extensive collection of philisophical works can be viewed at any time at the Temple. 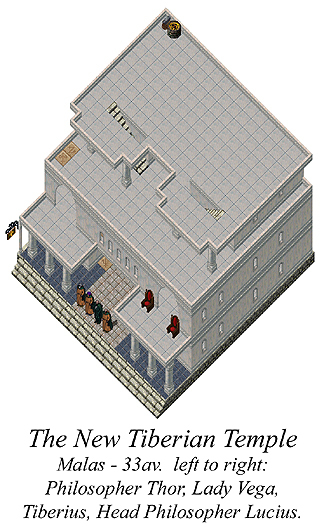 The Temple of Tiberian Virtues has been an important place for young knights to receive training which will further their discipline and strengthen their moral resolve. If your lucky you can find a teacher for the higher arts of combat. Scholars will enjoy debating with the Temple’s scholars and formulating their own higher ideals of virtue. Also Lucius, one of the monks, is an artist who will draw your portrait for a reasonable donation. The Temple offers a roleplaying atmosphere unique to the Baja shard. Here you can not only read about philosophy but you can also debate with the philosophers and gain insight from them. 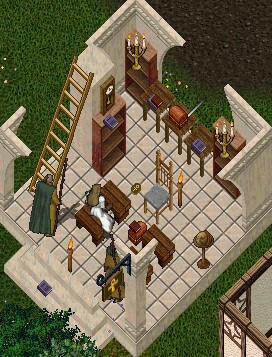 In addition to the regular roleplay that occurs here, the Temple also mediates disputes between guilds, hosts quests and events and weddings. If you haven’t visited it yet, you will definately want to come and explore the large library! The Second Temple in New Grimswind. The Temple and the surrounding Village disappeared during the Seventh Age.